HallBrite® BHB (Butyloctyl Salicylate) is a novel, patented multifunctional ingredient and dispersing agent ideal for sun care, skin care, and color cosmetics. It is effective as a sunscreen actives solvent, inorganic pigment wetter, emollient, moisturizer, and carrier. A low viscosity liquid of high polarity with elegant slip and feel, it is useful as a solvent and emollient in topical preparations for skin and hair. HallBrite® BHB significantly increases the in vivo SPF performance of sun protection products through the reduction of electron transfer and photoprotection mechanisms. 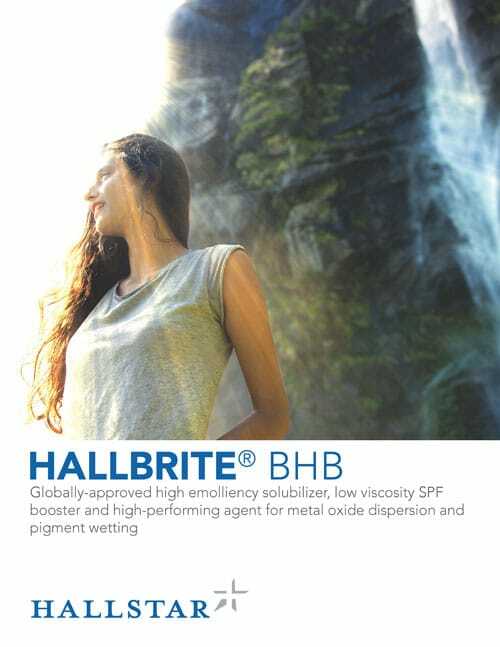 HallBrite® BHB combines lower potential irritation compared to similar materials, excellent spreadability, added substantivity in the presence of water, and a pleasant, moisturizing skin feel. It is compatible with most lipophilic cosmetic additives, and solubilizes many commonly used active ingredients including Oxybenzone and Avobenzone. Its low freeze point (< -25°C) gives HallBrite® BHB the ability to maintain these actives in solution at low temperature. It is an excellent carrier for micronized Titanium Dioxide, Zinc Oxide and cosmetic colorants (inorganic pigments). Recommended use level: 2-10%. Ames Test: No evidence of mutagenic activity. Chromosome Abberation Test: No evidence of clastogenic activity. Guinea Pig Maximization Test: No dermal response indicative of sensitization at 100% challenge. Primary Eye Irritation: Not a primary eye irritant. Primary Skin Irritation: Not a primary skin irritant. Potential for moderate irritation when applied at 100% under occlusive wrap conditions. PII - 2.12.